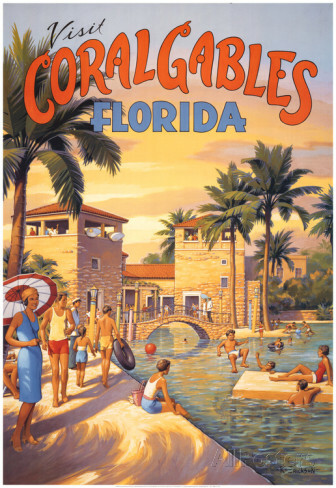 Vintage Florida Travel Posters and Prints at Ace's Web World. Featured on this page are these Florida posters: Go by Train, Island Bar, Paula Scaletta, Paradise Cantina, Miami Beach, Kerne Erickson, Fort Lauderdale, Coral Gables, Orange, Beach Aero, Palms and Sunshine, Sun versus City in Winter, versus Snowballs, on Parade lyrics, Riviera of America, Sand in My Shoes Poem, Greeting Card from Kissimmee, Crate of, Hitching to St Pete. For more beautiful Florida scenery and photographs, surf on over to these Florida pages.